September 26, 2008. We first learned about Craig Burkhead and his 1967 Yankee from the archived posts he made on the Sailnet Forum in 2006. It being a rainy day here in the Northeast (website maintenance day) your webmaster called the phone number given and ...Contact! Aviva is going through one of those restoration phases we all know about but, hopefully, Craig will be in touch soon and let us know what's going on. 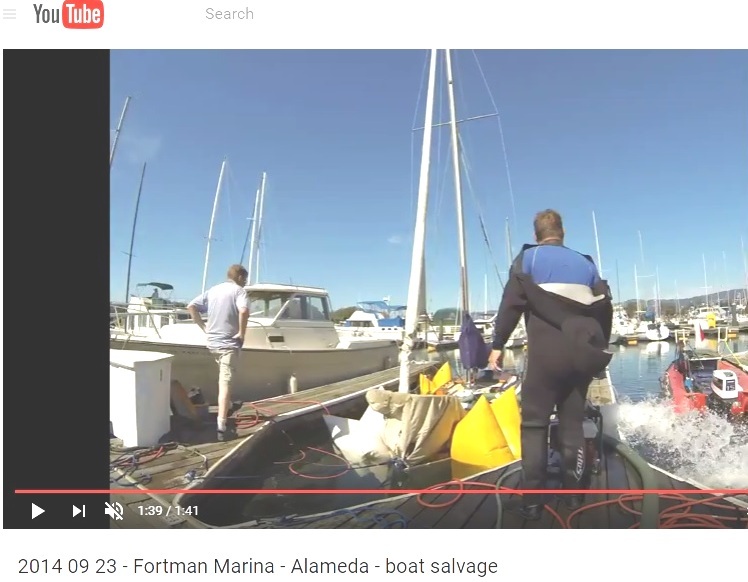 Here is what Craig had to say on the Sailnet Forum about his Nissan 6hp outboard. I purchased a Nissan 6 hp long shaft for my Dolphin (no alternator, though), and have been very pleased with the results. While I initially fitted an 8 hp Nissan (smallest two cylinder Nissan makes, which I would have preferred), the 8 hp wouldn't turn in the transom very well. BTW, I also have a backup 2 Hp Honda. While noisy (air cooled), it moves my Dolphin along fairly nicely so long as I'm not fighting current. I was surprised, but I can get four knots at full(?) throttle. Not recommended for regular use, but as a backup, works nicely and is light weight (35, maybe 40 lb?). January 25, 2017. DFI's are always working - we got the following email from DFI Scott Henry, Amaya, (http://www.dolphin24.org/Amaya.html) who keeps his Dolphin in the same marina as Aviva. If you have contact info for Aviva (Fortman slip E24), they need to go check their boat, it is lying very low in the water. The cockpit is full of water (up to the CB pennant hole, so some has gotten into the boat). Dolphin staff sprang into action from 3000 miles away, and located contact information for Craig Burkhead, Aviva's owner, and forwarded Scott's email to Craig. All is well. I just re-read the initial email and it brought back fears of her sinking a couple of years ago, and leapt in the car from work to head to the marina without another thought. Due to severe storms we've recently experienced in northern California, both cockpit drains had some detritus covering the drains and perhaps ten centimeters of rainwater had accumulated in the cockpit, plus some water in the cabin, which I pumped most of it out. I'll get the rest during the weekend. I hired a salvage diver, who attached inflatable bags around midsection and aft, and inflated with compressed air. Took several hours to raise, mostly due to difficulty in getting a strap under the keel in the soft marina berth mud. Maybe six of water above the deck. The boat was converted to electric drive, so Torqueedo trolling and main propulsion motors, plus batteries, SSB/VHF radio, instrumentation, all shot. The root cause was the starboard cockpit drain. The plastic hose had become brittle over the years and I didn't inspect closely enough. The cause was confirmed by the diver when she was raised. All he had to do was put a slight finger pressure on the hose, and a stream of water sprayed out. No pressure, no stream. I have been neglecting her since she sank, saving up some money for a more complete rehabilitation. Hopefully this coming year, but we shall see. Thanks again for the interest and concern, always appreciated! Postscript - follow up on timing - with Scott's and your email, I was at the marina within the hour, driving as fast as my Prius would permit. En route, I called the harbormaster, who checked on the boat, and we talked for awhile when we returned to the harbor office. 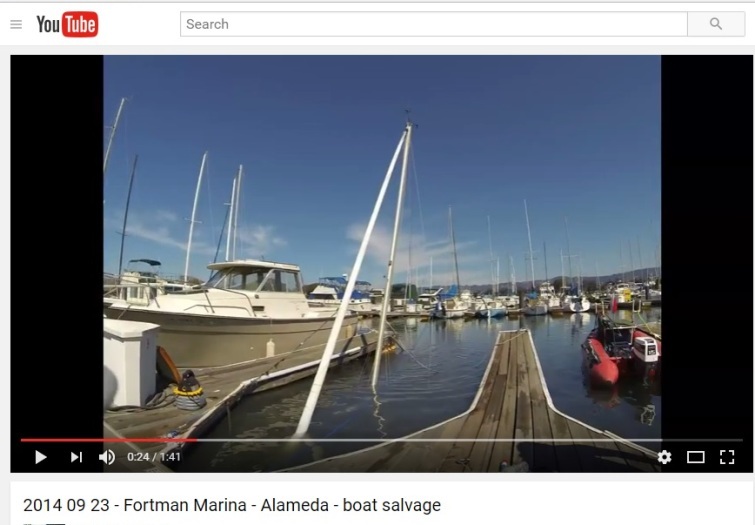 I've always had exceptional service working with the team at Fortman Marina (I have been there maybe 15 years). re: Scott -- much thanks again for noticing the water in the cockpit before this became 'raise the Aviva, part two'. *very* appreciated. Moral to this story - check your hoses!! I'm glad that I went the extra mile. I asked the harbormaster's office to contact you that your boat was riding low in the water, apparently they didn't. I had the same thing happen to me after the first big rain this season. Since I explicitly asked the liveaboard near Amaya to look out for her, he cleared the drains when he saw it. Last summer I had to replace one of the cocpit drain fittings. A lot more water would have gotten in the boat if I hadn't fixed it... I'll try to head over there Saturday. Webmaster Note: As this subject can only add to our list of sleepless nights issues we have added this Aviva segment to our Technical Section on hoses. Click here to go there. Thanks, I'll come by tomorrow and get her cleaned and drained.